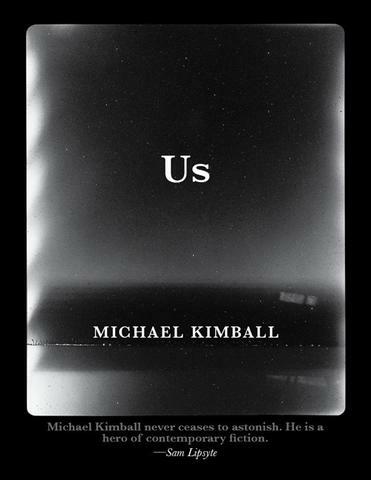 The following is an excerpt from the novel Us by Michael Kimball, available from Tyrant Books here. I had fallen asleep, but my wife hadn’t died. I had woken up, but my wife hadn’t woken up too. She hadn’t moved either. I whispered into her ear that it was morning, but she didn’t seem to hear me either. I nudged her at her shoulder and touched her upper arm, but she still didn’t open her eyes up, so I opened the blinds on the windows up. I turned her head to face the light coming in through the windows. I whistled bird sounds, but she didn’t open her eyes up or put a pillow over her ears or turn her face away or roll over away from the light. My wife hadn’t shifted her body since she had been in that hospital bed. She hadn’t kicked the bedcovers off of her feet and her legs or pushed the pillow onto the floor. She hadn’t tossed or kicked or thrashed or turned over in her sleep like she did when she would sleep in our bed at home. She didn’t wake up for the morning as she had on every other day of our marriage, but we ate breakfast together that day anyway. One of the nurses brought a tray of food into the hospital room and placed it on top of the table that swung over the hospital bed and my wife’s body. I told the nurse that my wife couldn’t eat or drink or swallow or chew, but the nurse didn’t take the tray of food out when she went back out of the hospital room. The nurse came back in with food and water for my wife that was inside iv bags. She hung the iv bags up on the iv stand and made sure that the drips worked. I watched the iv bags drip for awhile before I took the tray of food off of the table and set it on my lap and started to eat too. We ate breakfast together, but it still wasn’t morning for my wife, so I tried to make it into more of a morning. I decided to try to wash up. I pushed myself up out of that chair and tried to stand up, but the blood seemed to rush out of my head and I couldn’t really breathe right either. I had to use the armrests of that chair to hold myself up. I was bent over but standing up until I got my breath back. I tried to stand up straight again and my head cleared up. I took my hat off and left it on top of the back of that chair. I took my jacket off and hung it around the shoulders of that chair. I pulled the sleeves of the jacket around to the front of that chair and left them resting on its armrests. I wanted to make it look like I was sitting there, or at least make it seem like I was nearby, if my wife woke up. I didn’t want her to wake up without me there with her. I didn’t want her to be awake and alone at the same time. I went into the bathroom inside her hospital room to take however much of a bath or a shower that I could. I smelled like sleep and I wanted to wash the sleep off of me. I took my clothes off and hung them up on the back of the bathroom door and laid them out on all of the handles and bars that are supposed to help people to get up or to stand up inside a hospital bathroom. I turned the water faucet on and washed myself off with wet paper towels, and I dried myself off with dry paper towels, but it didn’t really make me feel clean. I felt dry and tired. I felt like I had somehow shrunk. I turned my underwear and my undershirt and my socks inside out. I wanted to have the clean side of them touching my skin when I put them back on. I shook the rest of my clothes out. I tried to get the sleep off of them too. I tried to move some air through them too. I got dressed again, but my clothes felt sticky and thick on me and it was difficult to move in them. My pants could almost stand up on their cuffs on their own and my shirt seemed to keep its own shape around my shoulders. My clothes looked stiff and wrinkled and so did I. But my clothes also helped me to stand up. I was trying so hard to stand up straight then. I needed something else to hold me up then. I stood over the bathroom sink and looked at myself in the bathroom mirror. I looked smaller and older too. I turned the water faucet back on and splashed water on my hair and on my face. I pushed my hair down with my hands and combed it back with my fingers. I wet one of my fingers again and brushed my teeth with it until my teeth felt smooth to my tongue. I straightened myself back up and stood back away from the bathroom sink and the bathroom mirror. I tried to straighten my clothes out some more, but they didn’t seem to fit right anymore either. My clothes and everything else seemed bigger than me. I tucked my shirt farther down into my pants and tightened my belt a notch. I took a long breath in and tried to fill my clothes out with myself. I was going to need all of me for this morning.